Hayate’s parents are attacked by Hisui, who’s angry that they messed up her plans. Hayate’s dad gets away, only to be met by his oldest son, who punches him. Mikoto tells Himegami that Isumi and the others freed Orumuzuto Nadja, thus the Royal Power has vanished from the world. She notes that it never had the power to bring someone back to life since it demanded a life for the wishes. Yukariko made two wishes – the first for her daughter’s protection and the other was that if the goddess were freed because of Yukariko’s efforts, she wants Himegami’s fifty years returned to him. Springtime has come. Chiharu was suspended because she couldn’t pay the tuition, Hayate is missing, and Nagi is attending a normal school. As Miki, Risa, and Izumi discuss this, Risa decides they are going to record Hina naked for YouTube. Hina takes off to find Hayate and attempt to confess her love for him. Two years later on Christmas Eve, Nagi, Chiharu, and Kayura are sharing a regular apartment. Chiharu is a successful novelist. Nagi has learned to cook, has joined the lacrosse team, and has a job. Nagi stops by the park where she first met Hayate and ponders things. Two guys try to pick her up, but she sends them packing. Hayate is hiding in the bushes and Nagi knows this. After Nagi brags about her independence, Hayate says he wants to be with Nagi. They decide to talk and go off hand in hand. Har! 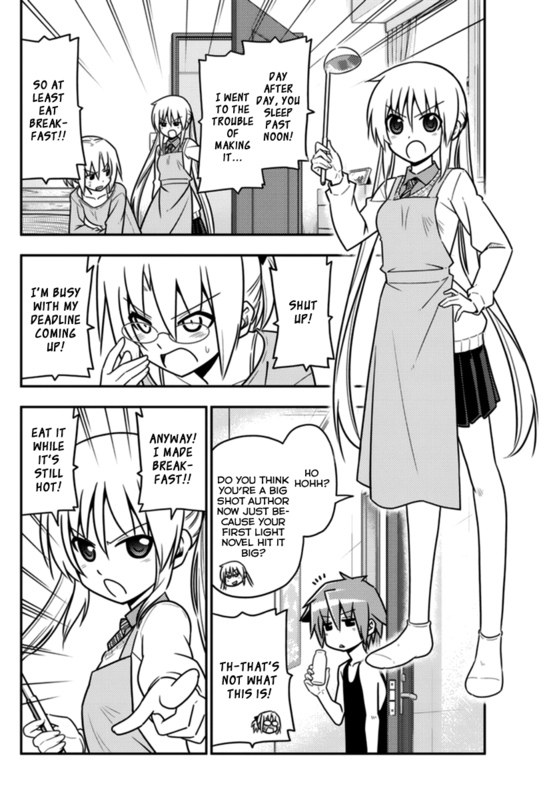 Hayate the Combat Butler chapter 568 proves why Hata-sensei wasting so much time was stupid. 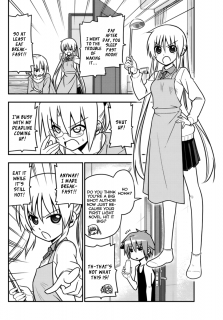 There’s no doubt that readers of this manga would agree that Hayate’s parent’s need punishment. After all, they constantly used their young son for all kinds of illegal activities. Then they sold him to pay off debts and saddled him with the debt. Then they tried to screw him over once again. So yeah, we want to see them get their comeuppance. That said, what is Hisui’s motivation to attack Hayate’s parents? The manga claims that they ruined her plans. How did they ruin her plans? If anything, they helped her plans move forward. Even without them, eventually the bomb between Hayate and Nagi would have gone off. Nagi would have opened the path to the Royal Garden at some point. That aside, in the end, Nagi gave everything to Hisui, which totally mollified her in the end. As such, it makes no sense for her to be there. Ditto Hayate’s older brother Ikusa. How lovely that he just happens to appear in time to punch his father in the face. Naturally, there’s no acknowledgement of their relationship. And Dr. Kurosu gets a cameo, implying that she brought Ikusa here. So I guess she’s involved ’cause (1) she knows at least some of Hayate’s and Ikusa’s story and (2) she was conned by Hayate’s parents? But, there are no pages for explanations or anything else so there you have it. Show Don’t Tell Denied! And More Denied! Because there is no time, we don’t get to see Nadja being freed, even though that would have been nice to see. Instead, we get exposition from Mikoto who naturally knows stuff now that all is said and done. Blah, blah, blah. Then there’s the waste of space, Himegami. Seriously, there should have been a lot more development of his character, including showing him being Nagi’s butler. Had we received this development, his part of the story would have had more impact. Instead, I just didn’t care. We see a montage of most of the characters indicating that life goes on. Naturally we can’t really see any of it because there’s no time. And then there’s the travesty of Hina’s confession to Hayate. We only see her start it, be we are denied seeing her finish it. Heck, we don’t even know if she really saw Hayate or what. After all, Hayate was missing, so how would Hina magically find him one spring afternoon? Technically, this continues the violation of the show don’t tell rule. Having the manga skip forward two years to show how much Nagi has grown and matured would have been so much better had we gotten to see more of this. Again, there was no time for it, so we just get told that Nagi is good as sports now, good at cooking now, and good at life. While I’m happy for the Nagi character, imagine if Hata-sensei had done a few aftermath chapters so we could see more of this? So Nagi’s good and can defend herself now. Yay! But the whole thing with Hayate was just utter pap. He’s stalking her in the bushes and magically wants to stay with her. Nevermind what the heck he’s been doing for two years. 🙄 Sadly, despite her independence and learning that she could do anything, she never moved on from Hayate. There’s a part of me that understands that for sure, but it just doesn’t come off very believable. Again, had we seen Nagi’s journey through these last couple of years (and Hayate’s for that matter), the groundwork could have been laid to make the ending work. As it is, we get what we get, which isn’t satisfying. There are more things I could discuss, but I’ll save them for my series review. I’ll write my final thoughts review on the series in the forthcoming days. 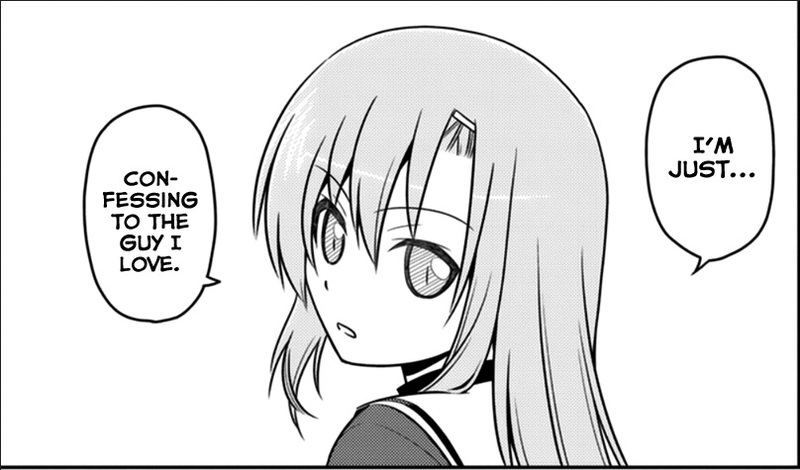 In the meantime, Hayate the Combat Butler chapter 568 brings a less than satisfactory ending to the series, not because of whom Hayate ended up with, but because Hata-sensei wasted so much time over the years doing pointless gag chapters rather than work on the plot and construct a good ending. See, maybe Hata wouldn’t have done this if he hadn’t seen his pal Akamatsu pulling it off without his career crashing down and burning. Fans being so forgiving at authors has basically just given them free passes to fail at their stories however they want to. As I’ve gotten older, I’ve become more cynical and jaded, I think. If Hata-sensei continues Ad Astra Per Aspera, I will continue to read it, but I won’t get overly hyped about it. My goodness, what a p*ss-poor ending. You pointed it out exactly: He had years to develop a proper ending, but instead he putzed around and forced his Nagi finish through, no matter how little sense it made to begin with. Hina not even got a proper reaction to her confession? She’s the character who constantly helped out others at her own expense, and she got _nothing_ in return. Screw you, Hata. It was visible that you froze her out for 1-2 years in hopes to get people to warm up to Nagi, but this was a truly pathetic “well I’m the author and you’re not” override. Maria’s ending was even worse, because it didn’t make any sense at all whatsoever. Hope you’re happy, Hata, because I’m most definitely not – and based on the fan reactions, the clear majority isn’t either. Have fun with your next work, but I won’t be joining you. Sorry. I’m with ya! I will read Ad Astra Per Aspera because I liked what I read so far. However, I won’t be getting hyped for it. It sad it ended the way it did. The author will regret train-wrecking the series due to perhaps mood change and disappointment. I can understand wanting to move on, decade and half is a long time. Still, i see this way. It a gag series at heart, it should have ended that way at the end with touching (perhaps logical) conclusion to the series. Hayate is much older than Nagi, frankly his relationship her being future lover make no sense. Hina could have made more sense, but Hayate didn’t seem to be there yet emotionally. Given how badly his parents abused the hell out him emotionally. In my mind, the only person Hayate had a real romantic connection with was Athena. That ship sank only because Hata-sensei forced Athena to sink herself after he failed to sink her years ago. Ayumu and Hina come in second. She has other powers too, but I get your point. It seemed more forced than anything. Hayate and Ikusa should have been the ones to stop their parents. I dunno, I am in agreement with you folks about the weak ending. The only positive thing I could think of was that Nagi finally ‘grew up’. She becomes independent and no longer needed someone to help her or be her support to get things done, first with Maria leaving and then Hayate. Doing things herself she develops into her own person, learns to cook, and even play sports, and looks like become a better social-able person. Or maybe a better and mature catch to finally marry. It was nice to see how Nagi developed, but this is about Hayate. What did he do for two years? Did he move on to better things as in move onto a life or profession? Was he hiding in the bushes all this time? What did he do during that time??? Hisui just vanishes too?…or yeah, eat cake … then forgot about she even existed. Soo many loose ends left dangling. What was that whole short thing about Maria catching a dragon? I was expecting the dragon to do something…but nothing happened. Also major things happening around some vending soda machines in a park, and now the significance of christmas eve for everyone. If felt a bit creepy that Hayate was sneaking and watching Nagi from the bushes rather than just come straight out and see Nagi. The only positive thing I could think of was that Nagi finally ‘grew up’. She becomes independent and no longer needed someone to help her or be her support to get things done, first with Maria leaving and then Hayate. Yes. Nagi’s growth through the course of the manga is a very nice character arc. It was nice to see how Nagi developed, but this is about Hayate. What did he do for two years? Did he move on to better things as in move onto a life or profession? Was he hiding in the bushes all this time? What did he do during that time??? Haha! Yes. It seems Hata-sensei is inferring Hayate went the stalker route for two years. Hisui just vanishes too?…or yeah, eat cake … then forgot about she even existed. Yeah, that’s all part of the problem of not starting the wrap up of the manga years ago. New visitors — if you see posts with the images improperly placed, it is a known issue that I have to manually fix. It will take considerable time to get them all. I will keep a daily update here to track my progress. 06-Feb-2019 : Reached post dated April 10, 2009, and quite a number of scattered ones earlier than that (usually based on cross-linkage or what’s currently trending), including all of 2006. 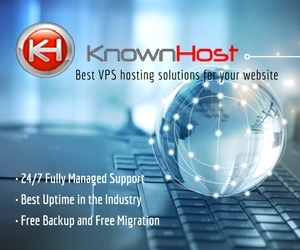 Proudly hosted by Known Host!